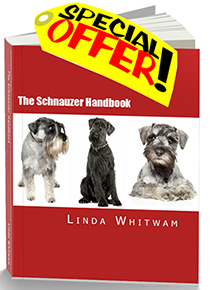 Are you ready to start Schnauzer training? First of all, well done to you for choosing a dog that responds well to training! Miniature, Standard and Giant Schnauzers are all generally easy to train with the right approach and techniques. They love being with people and are eager to please their owners. Start training your Schnauzer puppy early on. Like babies, puppies learn quickly and it's this learned behavior which stays with them through adult life. Old dogs CAN be taught new tricks, but it's a lot harder to unlearn bad habits. It's best to start training with a clean slate! Avoid giving your dog commands you know you can't enforce. Schnauzers are intelligent dogs. Every time you give a command that you don't enforce, he learns that commands are optional! Train your dog gently and humanely. Teach him using positive, motivational methods. Keep Schnauzer training sessions upbeat so that the whole experience is enjoyable for you and him. If obedience training is a bit of a bore, pep things up a bit by "playtraining". Use constructive, non-adversarial games such as Go Find, Hide 'n' Seek or Fetch the Ball. Use an assertive - NOT loud voice. When you're giving a command, your tone of voice should be calm and authoritative, rather than harsh or shouting. This applies even if your Schnauzer is unresponsive at the beginning. Begin your Schnauzer training around the house and garden (if you've got one). How well your dog responds to you at home affects his behavior outdoors as well. 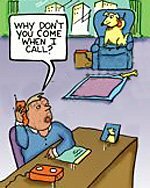 If he doesn't respond well at home, he certainly won't respond any better outdoors where there's 101 distractions, such as other dogs, people, sidewalk food scraps, cats, birds, etc. One command equals one response. Give your dog only one command -twice max - then gently enforce it. Repeating commands or nagging will make your Schnauzer tune out. They also teach him that the first several commands are a bluff! Telling your dog to "SIT, SIT,SIT, SIT! ", is neither efficient nor effective. Simply give your dog a single "SIT" command, gently place him in the sitting position and then praise him. It's all about good communication. It's NOT about getting even with the dog! If you're taking an "it's-me-against-the-dog, I'll soon whip him into shape" approach, you may eventually force your dog into submission. It will, however, undermine your relationship - do you want a dog that flinches when you approach him? You'll also miss out on all the fun that a positive training approach can offer. Use your Schnauzer's name in a positive manner. When Schnauzer training, try not to use it when you are reprimanding, warning or punishing him. He should trust that when he hears his name, good things happen. His name should always be a word your dog responds to with enthusiasm, never hesitancy or fear. Don't give your dog lots of attention (even negative attention) when he misbehaves. Schnauzers LOVE attention! If he gets lots of attention and handling when he jumps up on you, that bad behavior is being reinforced and is therefore likely to be repeated. If he jumps up, push him away, use the command NO or DOWN and then ignore him. BE PATIENT. Rome wasn't built in a day and a Schnauzer won't be trained in a day either! But you'll reap the rewards of a few weeks of regular training sessions when you have a happy, well behaved friend and companion for life. These Top Ten Tips are a great starting point. We do recommend that you sign up for dog obedience classes in your local area. Another excellent way of getting started with your Schnauzer training or even correcting existing behavior problems is to invest in a dog training DVD. There's literally 100's of products out there. If you're interested, you'll find what we consider to be the 2 best ones in our Training Courses department of the Schnauzermania Store. How Much Exercise Does a Miniature Schnauzer Need?